Cold therapy is a highly effective method of pain management and is especially useful after an orthopedic trauma such as a serious sport’s injury, during physical therapy and post surgery, including arthroscopic, reconstructive and plastic surgeries. When used correctly a cold therapy system decreases fluid buildup, reduces swelling and limits muscle spasms. It also slows the release of chemicals which cause both pain and inflammation. The end result is a faster, less painful recovery. 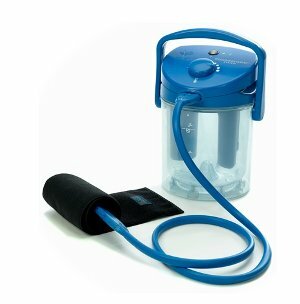 There are a number of cold therapy systems currently available on the market. The following is a quick check list to help you identify the cold therapy system that will work best for you. Is the system comfortable? If you will be wearing the device for long periods of time, comfort will matter. Look for a cold therapy pump system that is ergonomically designed to provide comfortable area coverage and allows custom-tailored temperature control. If you are allergic to latex, seek out systems that use Latex-free pads. Is the system easy to clean? Moisture breeds bacteria so it is important to choose a system that is easy to clean. This is critical if you are rehabilitating after a surgery as incisions are especially vulnerable to bacterial infection. Does the system need to be portable? Will you be using it exclusively at home, or will you be traveling with it to a rehab clinic or another away location? If you plan on taking the cold therapy system with you on the road at any time, look for a system that is both compact and light weight. A smaller system will also make storage easier. If you plan on using the system in locations that do not have electricity outlets, choose a system that offers a manual pump option. How important is convenience to you? If you are looking for convenience, seek out a system that is easy to use and quiet. Higher quality products and medical device sites will also feature helpful instructional videos. Is the system dependable? Look for a respected name brand cold therapy manufacturer such as Breg, Ossur or Vitalwear. These systems offer superior filtration systems and motors, backed by reliable warranties. The result is a high quality system that reliably delivers consistent temperature. About the Author: MMAR Medical Group Inc. is a supplier of orthopedic medical products including a wide selection of cold therapy devices as well as braces and supports. For quality back braces, a wide knee brace selection and other quality braces, please visit MMAR Medical online.